One thing that I really like about the Green DIY Energy program is the instructional videos. In the member’s area, there are a total of 6 videos. The videos are High Definition and professionally done which make them very sharp and clear. There are many DIY home solar or wind power videos that you can find on Youtube. The problem is, the quality is really bad. Most of the time, you can’t even see or hear what the person in the video is trying to say. Luckily, you don’t have this issue with Green DIY Energy. 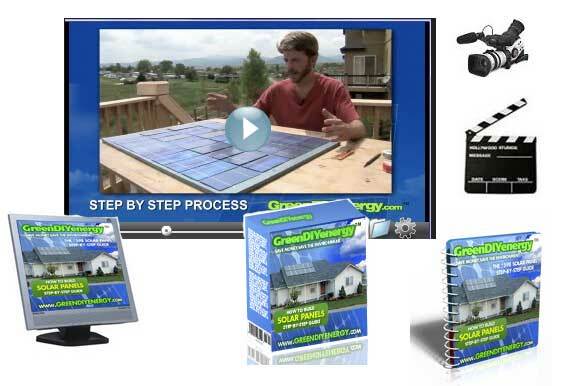 The video series in Green DIY Energy is “Build your own solar panel for less than $100”. The first video in the series is on the process of building your own solar panel. The difference here is to make it with a budget of less than $100. Is it possible to work with such a small budget? Yes it is, if you follow their recommendation. To make your own solar modules, the first step is tool preparation. In the first video, it shows you what are the tools and material you will need to build the solar panel. The video was shot in Boulder, Colorado and the host is Bryan Clark. Bryan started off by outlining all the different material and methods you will be using to build a solar panel that can produce 75 watt of power. What are the tools you’ll need to build a solar panel? In the video, Bryan introduced 19 different kinds of tools and safety equipment to get you started. You’ll see him talking about the tools and what you will use it for. Some suggested tools are hand drills, caulking gun, soldering gun, multi-meter, leveler etc. After Bryan is done introducing the hand tools, he goes on to explain the material you will be using for a Do It Yourself (DIY) solar panel. In this section he goes through items such as the Photovoltaic (PV) cells, wires, electrician tape, wood glue, blocking diode, silicon II caulk etc. If you are wandering what type of wires to use, Bryan also gave a very good recommendation in the video. How do you select the solar cells? Do you use PV cells with tabbed or without tabbed ribbon? Bryan actually explains the pros and cons of the different solar cells. Do you want to use a residential solar or wind power system to reduce your home energy consumption? If you do, be sure to check out the Green DIY Energy program. For a comprehensive Green DIY energy review, go to www.greendiyenergyreviews.com. 1) Northeast Sustainable Energy Association – Promoting sustainable energy solution.